Welcome to Vancouver, Canada’s largest, densest and most ethnically diverse city! Vancouver has a lot going for it: a bustling downtown, delicious restaurants, a rich cultural life, and more. But if this is your first time here, get ready to be amazed by many other things. 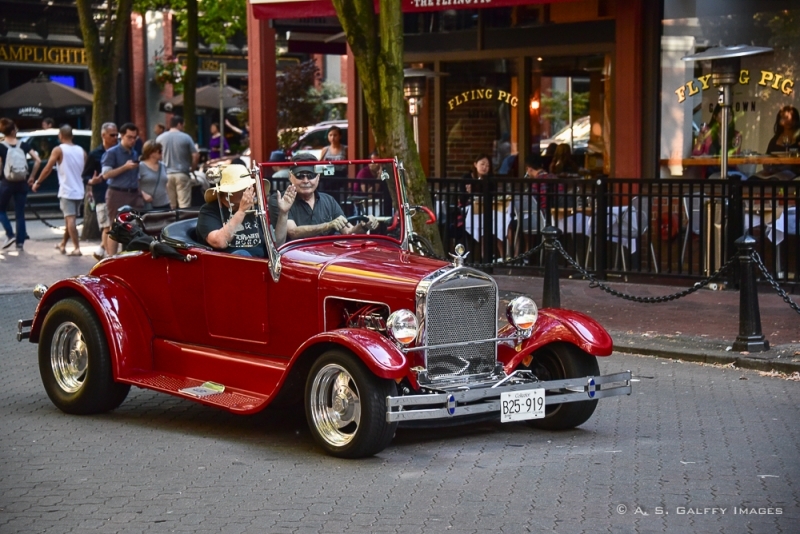 When you look at Vancouver with a fresh pair of eyes, you always tend to discover the “little things.” Things that Vancouverites most likely no longer observe. Like the waterfront, the pine trees, or the mountains.The store fronts, the sidewalk cafés, or the vibe of the streets. 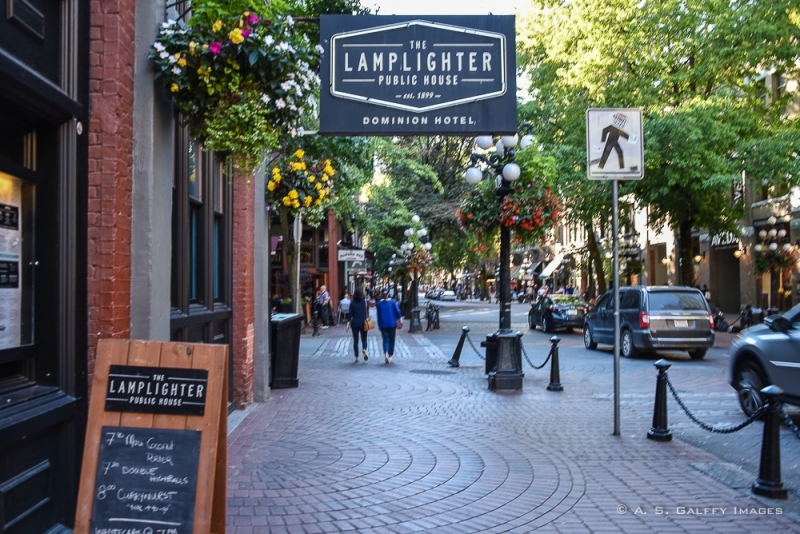 As a firs time visitor, it’s the little things that will catch your eye in this place and help you make your Vancouver first impressions. What most impressed me about this city is its close proximity to some of the most beautiful places in Canada. For instance, you can drive from Vancouver to Whistler in just a short hour and a half! 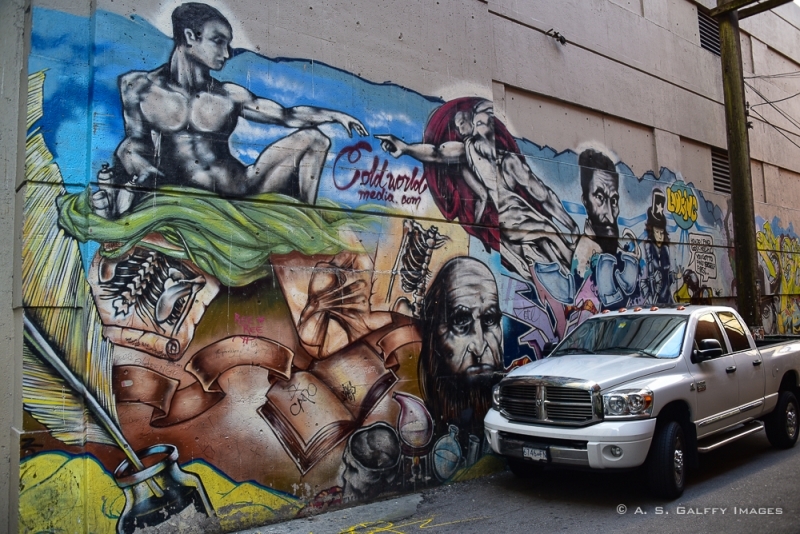 But Vancouver has way more to show for itself than just its proximity to other attractions. The first thing that strikes you as you arrive in Vancouver is how stunningly beautiful the cityscape is! The nearby mountains look like they climb right out of the ocean, the air is crisp and everything around you is clean and colorful. I always had a thing for cities with dramatic backdrops! 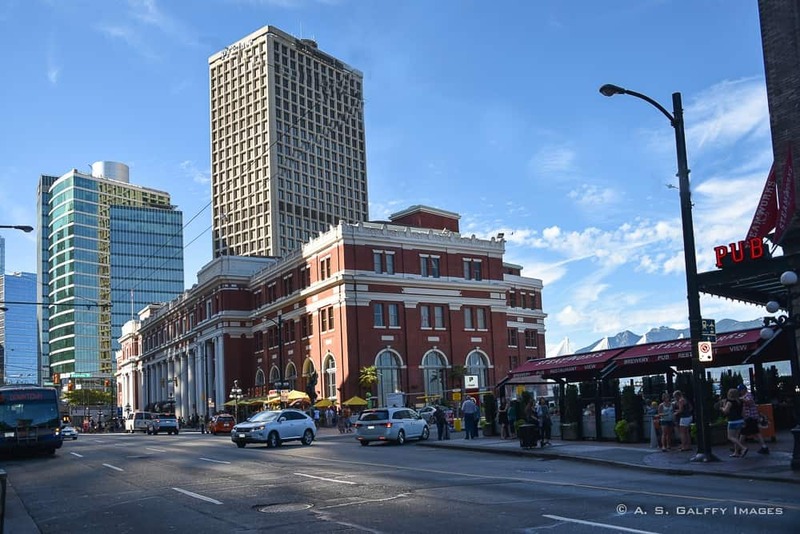 The second thing thing you’ll probably notice is that despite being a big city, Vancouver is actually calmer and more laid-back than similar metropolitan cities, like San Francisco for instance. Vancouver is very young. Considering that only 150 years ago this place was a virgin forest, it’s amazing to see how far the city has come in such a short time. 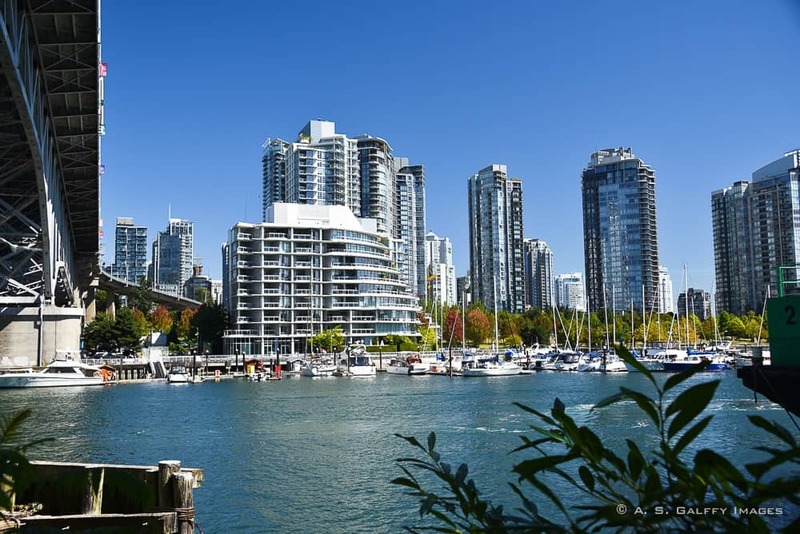 The first inhabitants of Vancouver were the British, but with the Gold Rush in the 1860s tens of thousands of Europeans, Americans, South Americans and especially Chinese came here to make money in the gold field. The city’s population is very diverse, with over 200 ethnic groups reported. But despite the diversity, only one group accounts for about half of all visible minorities: the Chinese. 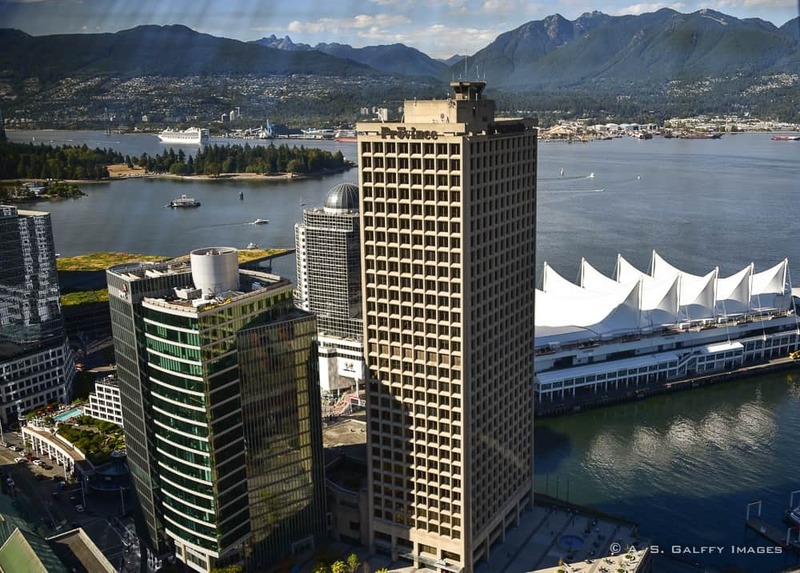 Vancouver counts itself among the most attractive waterfront cities of the world. 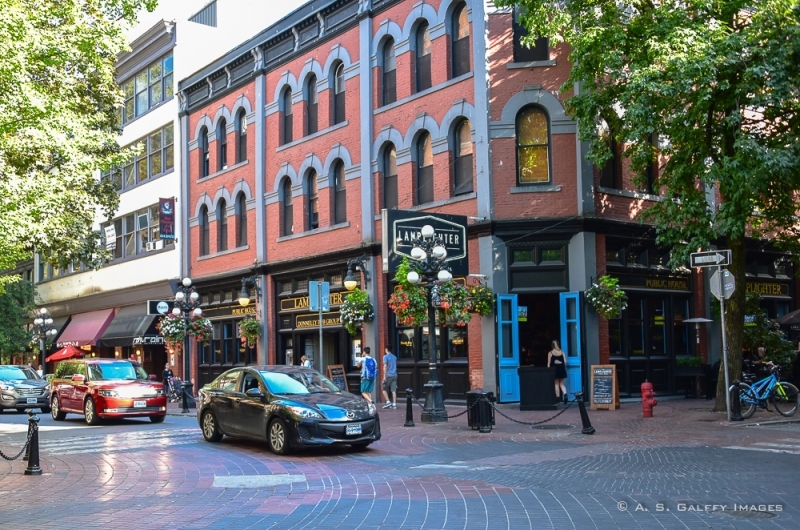 The city’s history began in what is today the trendy Gastown, a historic site at the northeast end of Downtown. Until 1867 this entire area was but a vast forest with huge trees. But within 3 years of the opening of the first saloon in town, a small community began growing up here. The community later became Gastown, being named after “Gassy,” the funny and talkative steamboat captain who kept the saloon. 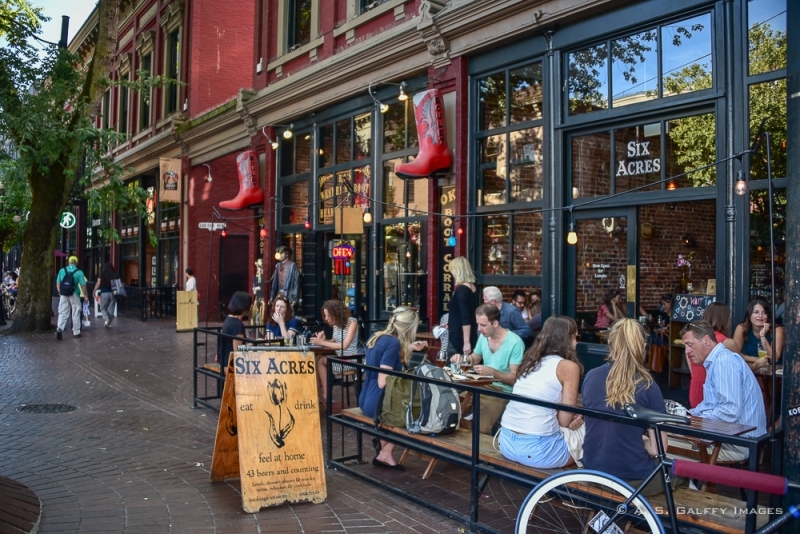 Gastown is a lively and fascinating area, with a great range of shops and restaurants. The streets are lined up with old-fashion lamp posts, attractive store fronts, flower baskets, and sidewalk cafés. It’s just perfect for wandering around and dining. 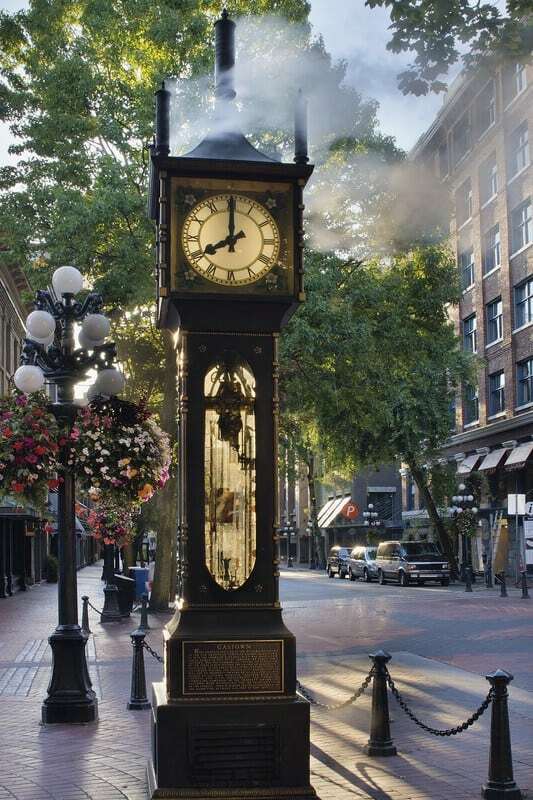 The biggest attraction of Gastown is the Steam Clock. Every quarter hour, the clock shows off a bit by shooting steam from its whistles, and on the hour it plays a chime tune, marking each hour with a honk from each whistle. The neighborhood is quite pleasant to explore during the day, but not particularly inviting at night. 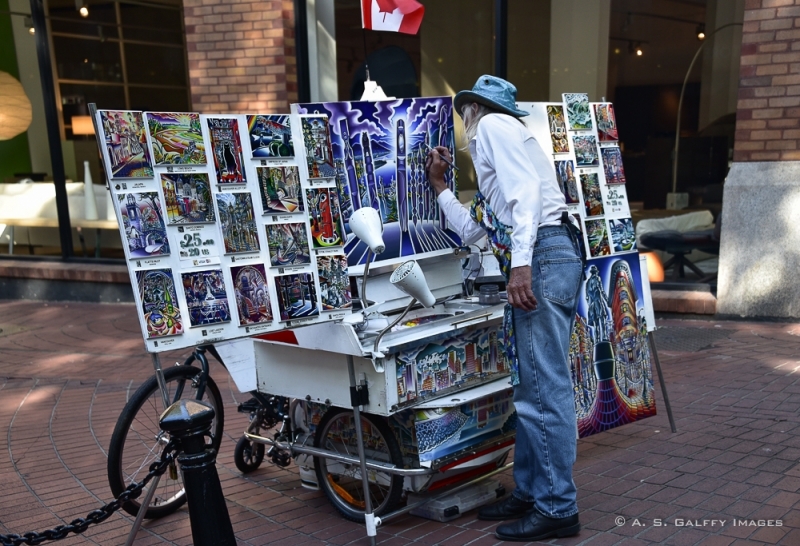 We saw many homeless people in some parts of Gastown. 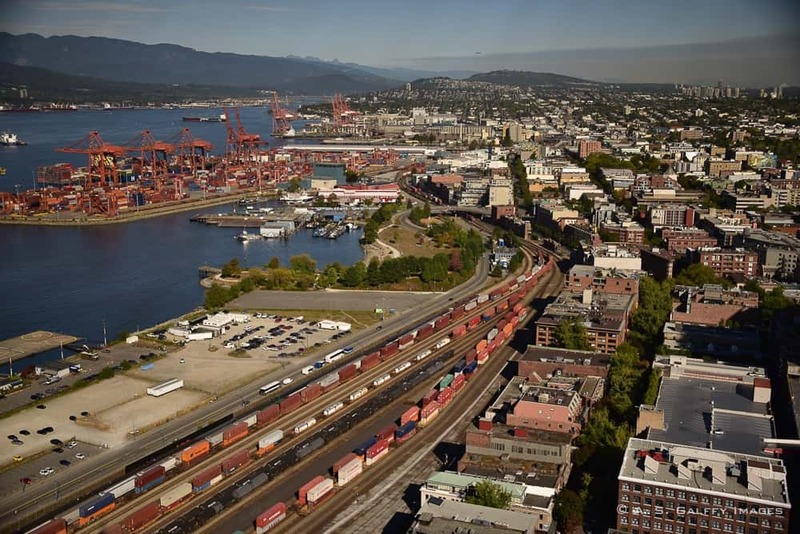 Unlike other cities where the industrial ports have been moved outside the city limits, the port of Vancouver is still in the heart of the city. The port was architecturally transformed so that it can be part of the cultural and social life of the city. 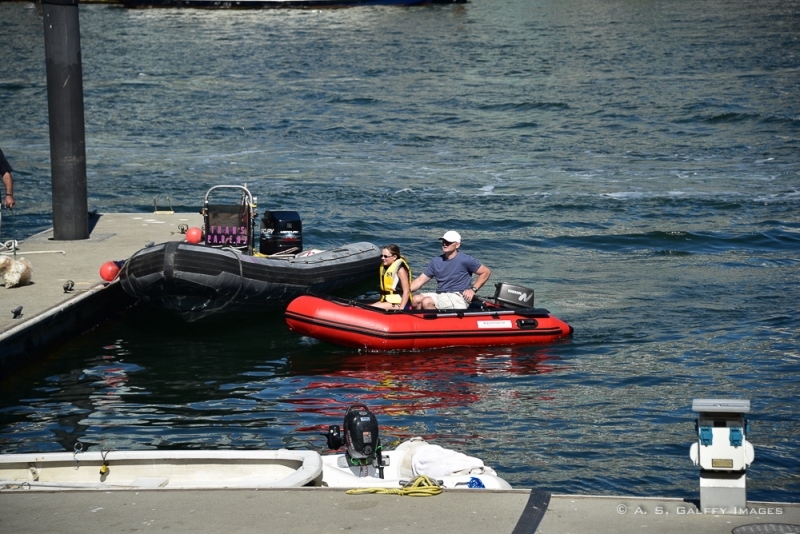 Although Vancouver is one of the busiest ports of the world, the waters here are surprisingly clean making fishing a great attraction in the area. One of my first impressions about Vancouver was how crowded the city actually was. Give its relatively young age, the city seems overpopulated. 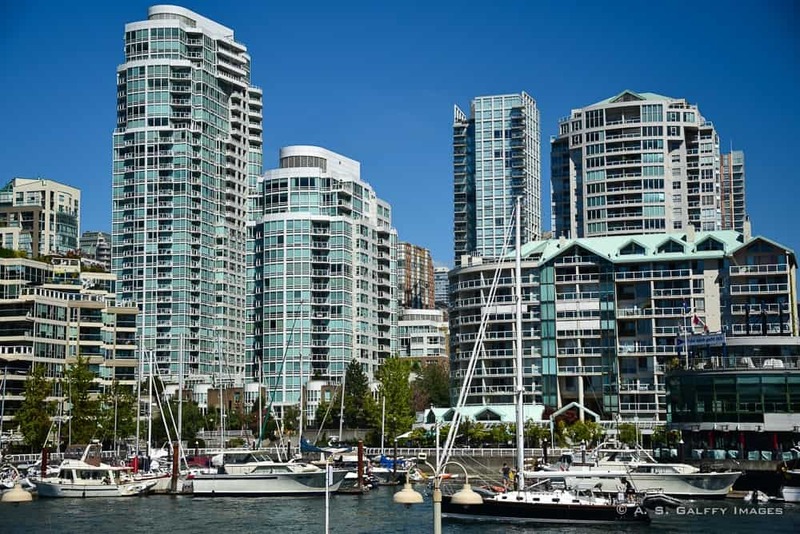 There are lots of apartment buildings and there is even a house-boat community in Vancouver. Vancouver started as a place to make quick money. Real estate was cheap back then, but today housing affordability became the No 1 issue in Vancouver. 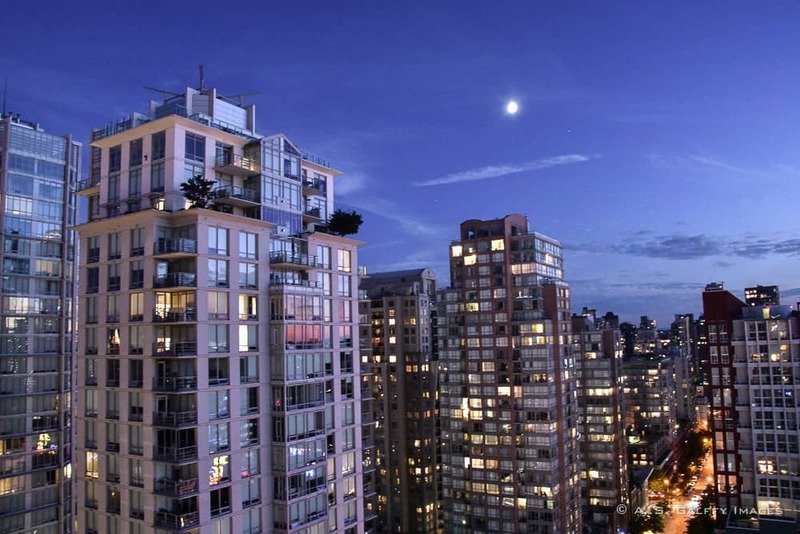 In fact, housing is so expensive that Vancouverites spend about 50% of their gross income on it. The average house price is around $900,000, so the city struggles to create as much inhabitable space as possible. The drawback is the size of the houses and the apartments which in time became smaller and smaller and smaller! Although lots of condominiums are being built, there are fewer and fewer rentals available. The cost of building these condos is greater than the rent that can be charged on them. But despite the fact that metropolitan Vancouver is becoming so overcrowded, people still keep trying to move into the city. Another thing that you may notice when you first visit Vancouver is the high percentage of Asian population. the highest proportion of Asians per capita of any North American city. In fact, 40% of Vancouver’s total population is made up of immigrants. Vancouverites love spending time outside and that’s no surprise. With such a spectacular nature around, it’s hard to stay indoors. Besides, when you live your life in a small apartment and such a crowded city, you want to spend as much time outside as you can. 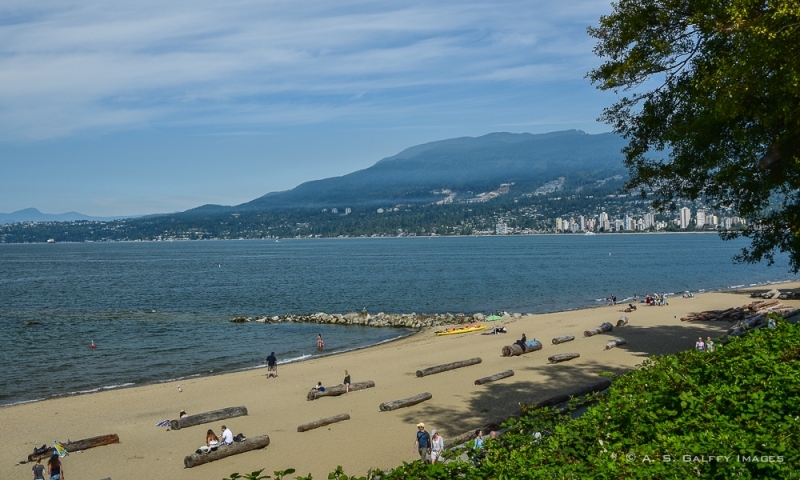 But visitors equally enjoy Vancouver’s outdoors, as the city brags about some of the best parks in the world. 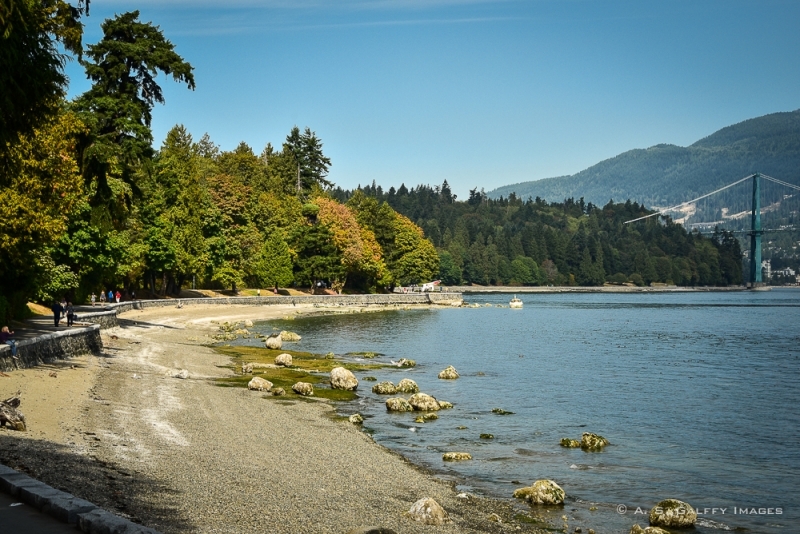 Visiting Stanley Park is one of the best things to do in Vancouver with kids. The range and number of outdoor activities in Vancouver is stunning. The city’s proximity to great mountains, lush forests, lakes, as well as the ocean makes it very easy for the people to access nature. No wonder that biking, kayaking, or skiing is a lifestyle in Vancouver. There is also a great array of museums, parks, beautiful beaches and markets that make Vancouver a great destination for families. Vancouver caters to any interest throughout the year and is blessed with more natural beauty than any major city in the world. There are many reasons why you should visit Vancouver: the bustling downtown, the vibe, the outdoors, the restaurants, the farmer’s markets. 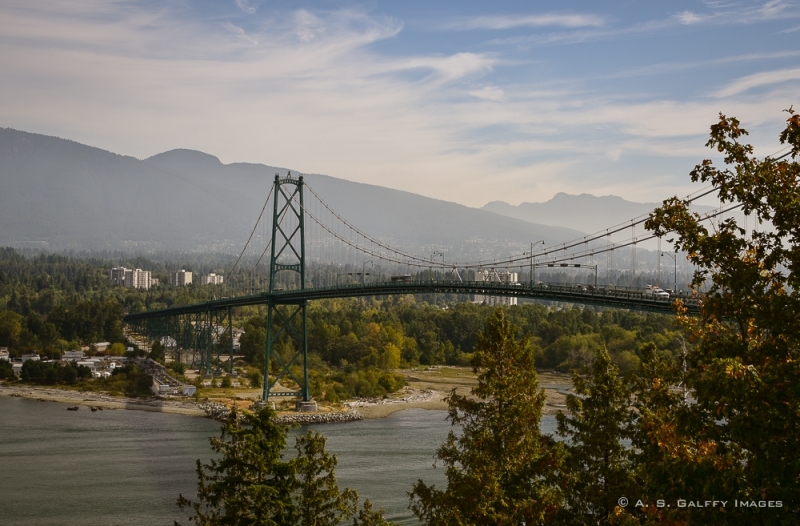 And if you happen to visit it on a sunny day, I’m sure Vancouver will easily become one of your favorite destinations. 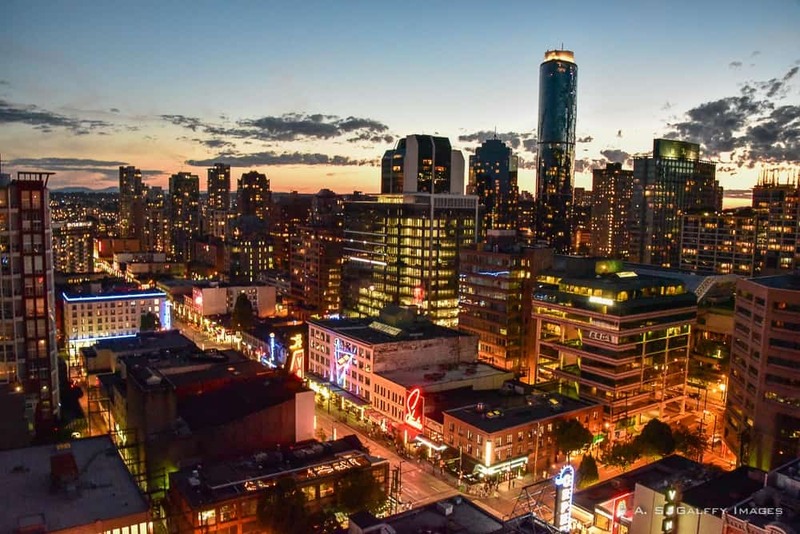 Your photos of Vancouver at dusk are fantastic! When I visited, I was so distracted by keeping an eye on my 3 youngsters that I didn't have time to look up at the sights. Those housing prices are ridiculously expensive. I guess I won't be moving there anytime soon. I suppose the topography keeps the city contained, and they can't have sprawling suburbs in all directions. "Slower than a snail drunk on molasses." That's hilarious! And sadly, pretty accurate for the shipboard Wi-Fi we've used - or, tried to. I do love Vancouver! The cleanliness of the city isn't something that I noticed right away, but really remember about it. The beauty of the city and surroundings, which you've captured so well, are what I remember most. Great city - can't wait to go back! -Rob. Thanks for your comment, Rob. I'd love to go back to Vancouver too. It's such a lovely city! What a beautiful city! I've only been to Toronto in Canada, but this looks like a lovely excuse to head back up! I'd love to see that steam clock ~ very cool! I love Vancouver - such a great city! I would move there in a heartbeat if it weren't so expensive! 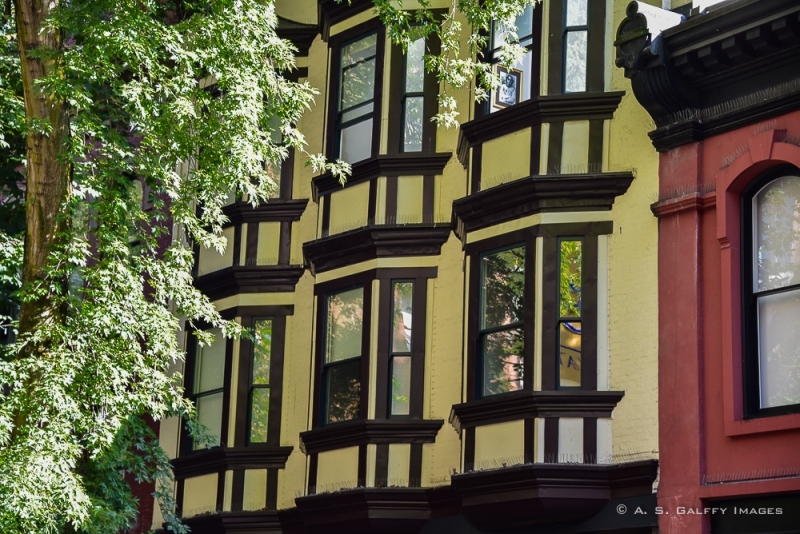 Fantastic photos, I love cityscapes. 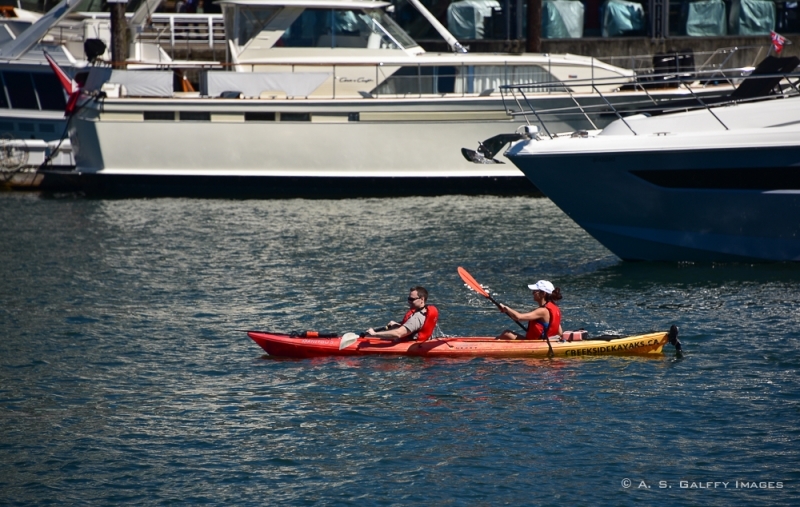 It sure looks like there is a lot to do both in Vancouver and the outdoor pursuits of the surrounding area. I love cities on water, they have an extra special something about them. Thank you, Jo. 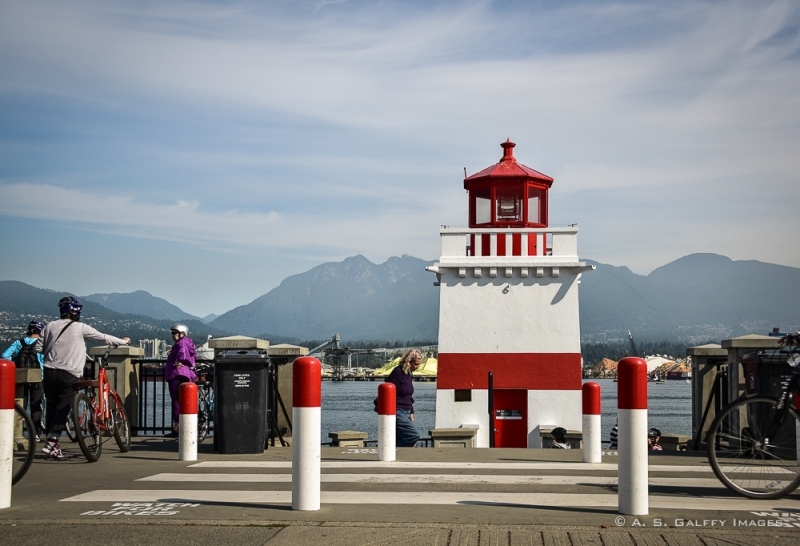 Vancouver is one of those cities you shouldn't miss if you like cities on the water. Haha, yes, cruises are typically not good places to work as a travel blogger but a great way to be unplugged. We have a cruise planned for June for 8 days and we know from our last cruise that the Internet is very expensive and also very slow and spotty - so will be just doing offline work. I have never been to Vancouver so nice to read some of your first impressions. Thank you, Jessica. Laurence would have a great deal to photograph in Vancouver, if you guys decide to visit this great city. Love the steam clock! I am sure you would have had a lovely and special experience on the cruise, without the internet connection. I just loved the short time I spent in Vancouver. My favorite thing was the Grouse Grind. I loved Stanley Park too. Would love to go back and explore more - such a great city. I've heard so many great things about Vancouver and would really love to go one day! Your pictures and impressions really push it up a notch! Pretty strange to think it was once a forest and now it's a thriving city! You'd love Vancouver, Lolo. It's in many ways like San Francisco. This looks the perfect destination. The city is stunning with access to the coast, we would love to visit! Vancouver is really very beautiful. Very much like San Francisco. Lovely photos of Canada's most scenic city! I love Vancouver as there is a beautiful vista in every direction you look. Even the architecture is stunning! Thx for sharing your memories with us. I'd love to go back to Vancouver, Doreen. Hopefully someday I'll make it even to Manitoba and pay you a visit. Thank you, Victoria. "Unplugged" may be good but it surely was frustrating. Vancouver is so beautiful, Suze. You should visit. That is absolutely stunning! I didn't know Vancouver was a virgin forest before. Interesting to see how far they've become. I am jealous. We had planned to go to Vancouver on our recent trip to Alaska but somehow it got cut out of the itinerary - maybe next time. I am so looking forward to your take on Alaska. You should visit Vancouver, Lyn. It's so beautiful! Glad you were able to log off and enjoy your cruise. I blogged nearly everyday from our Alaska cruise, and probably missed much of the on-board fun. We also ended in Vancouver, but didn't see that gas lamp clock - how cool. Love your photos of what really is a beautiful coastal city. Thanks, Rhonda. You were really lucky that you were on a cruse that provided Internet. Vancouver was lovely indeed. The cityscape is really stunning! I have only ever heard good things about Vancouver, would love to visit someday! Anda, I have driven through Vancouver so many times, but never really stop. I'm always looking to get into the wilderness. I love the clock photo. I guess I'll stop in next time. Really worth spending a few days in Vancouver, Corinne. You won't regret it. Beautiful pictures! Vancouver looks really gorgeous. I am so happy to see all these photos of Vancouver! I love, love the city. We went about four years ago and had an incredible time. I agree that the city and surrounding landscape is very beautiful We hope to go again one day. If we go back, we want to visit Victoria and Whistler too. I'd like to go to Whistler too, Ruth. I'd love to ski there in winter. I didn't realise Vancouver was so young!! Ha! My husband's been to Vancouver and thought it was gorgeous. I'd love to go one day. I can't believe it is only 125 years old. That's some rapid development! Can't wait to hear about your Alaska cruise - that's on my bucket list too. You should go visit Vancouver, Shobha. I'm sure you'll love it. I couldn't agree more. I know many who have been, but I haven't yet. Thanks for sharing Anda, enjoyed following along.